John Gannon, senior executive engineer with Clare County Council, project manager for the Ennis mains rehab project. Photograph by John Kelly. WORK on replacing 17km of leaky old water pipes and more than 200 lead service connections in Ennis, which has started in the Market area and Old Barrack Street, is expected to save 1.34m litres of treated water every day, according to the Mayor of Ennis Municipal District, Councillor Johnny Flynn. Councillor Flynn, a civil engineer, said the Ennis water system provides potable water to approximately 30,000 people in Ennis and the neighbouring areas of Barefield, Crusheen, Clarecastle and Doora, and to businesses that employ over 10,000 people. 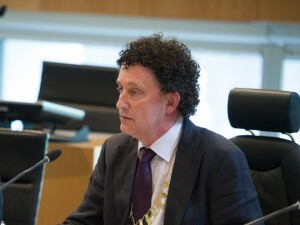 “I am aware that the Ennis water reservoirs currently store slightly less than a day’s supply of water – which is below best practice – and when you combine that with nearly 50% leakage rates of treated water – treatment of the water costs about €1m each year – in the pipe network, there is a serious security of supply issue,” Mayor Flynn said. Poor water pressure in some housing areas and the town centre creates difficulties for residents, businesses and for fire fighters, the mayor added. 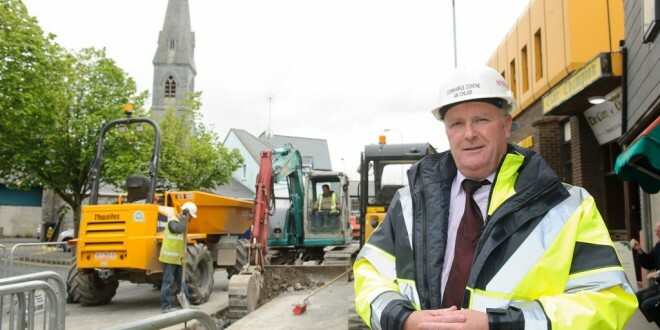 Ennis Mayor Johnny Flynn has welcome news work on the replacement of old water pipes in the town. “This €4.5 million contract now underway will make the town more attractive for future investment, improve security of supply and water pressure, improve the quality of our water and save nearly 1.4m litres of water each day by reducing leaks,” the Ennis mayor said. The work on the Ennis water main rehabilitation contract will see the replacement of about 17km of water mains in poor condition, 95 backyard and 978 front-of-house service connections, including 230 lead service connections, and the transfer of 44 service connections to a recently laid water main in Clarecastle, delivering improved levels of water pressure for customers there. A ring water main between Claureen Roundabout, Lahinch Road and Kilrush Road will also be re-commissioned to improve water pressure in those areas. Contractors Ward and Burke Construction Ltd began working on the Irish Water contract in the Market earlier this month, replacing the 50mm to 200mm diameter cast-iron, PVC and asbestos cement pipelines with polyethylene and ductile iron pipelines of 125mm to 315mm diameter. They have now moved into Barrack Street and will then move into Garraunakilla and Lower Drumbiggle Road, where the work is expected to be completed by June 7. The contractors will then move to New Road and expect to be there during July, before moving on to Harmony Road in August, the Tulla Road area in September and October and on to Ashfield Park Estate until November. Pine Grove Estate is also on the schedule for November and December. Work is expected to begin on Watery Road and Clarecastle in January 2016, moving to Hermitage, College Green and Grove, Kincora, Shannon and St Senan’s parks, Castlelawn, Fergus Lawn, Clare Road, Carmody Street and St Flannan’s Terrace, in that order, during February, March, April and May. It was intended to start the main drainage work at Woodlawn. However, this is now likely to be done probably in August or September this year. The Ennis project joins another major sewage infrastructural project already underway in the town. The €4.1 million Clonroadmore wastewater treatment plant upgrade, which started last September, is also due for completion next year.